Choose from our beautiful line of southwestern bedspreads which will complement your style, whether it's southwestern, western, rustic, mountain or cabin style. Shown above is the Phoenix bedding ensemble. Each piece is sold separately. The Phoenix design features a bold geometric duvet cover with contrasting faux suede bedskirt with studs and horse head closure. To finish off the look, we have an interesting array of bed toppers, including a distressed leather bedrunner, Euro shams (even a faux fur sham! ), western shams and a collection of throw pillows, each accented in a different way (with buttons, contrasting fabric or fringe) to make for a complementary, yet novel look. 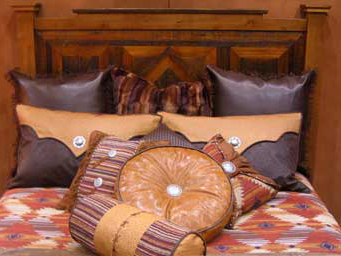 Since our southwestern bedspreads are made to order, please allow six to eight weeks from order to shipment time. Sorry, but we cannot accommodate rush orders. Pictured above is our collection of bedding toppers made especially to complement the Phoenix style duvet cover. From front to back: the distressed leather bedrunner (you can see this better in the photo at the top of the page), neckroll, round pillow, accent pillows, western shams and Euro shams. Southwestern Bedspreads - Shams Note: Shams do not come with inserts. Pictured in back are two Euro shams in stetson fabric with saddle welt. In between these two pillows is the Rabbit Patch faux fur sham. All shams are Euros and measure 26 x 26. In front of the Euro shams are Western Queen Shams (measures 20 x 30) with a contrasting flap and button. Also available in King size which measures 20 x 36. Order your Phoenix southwestern bedspreads and accent pieces today!